Swarm intelligence deals with the study of collectively intelligent behavior that emerges from a decentralized system of non-intelligent individual agents. The concept is widely used in the fields of simulation, optimization or robotics, but less known in the domain of generative art. This paper presents the swarm paradigm in the context of artistic creation, and more particularly explores the interest of enhancing swarm models with dynamics inspired from natural ecosystems. The authors introduce an energy budget to the agents of a swarm system, and show how mapping the energy level to visual information such as line width or color, combined with mechanisms such as resource chasing and consumption, enriches the search space of possible images. Moreover, the authors highlight that the approach allows the user to partially control the creation process of the drawings. The authors argue that the exploration of ecosystem dynamics in generative systems may open up novel artistic opportunities and shift the perspective from swarm art toward ecosystem art. Generative art is one of the most fascinating blends between art and science. It covers any practice “where the artist uses a system, such as a set of natural language rules, a computer program, a machine, or other procedural invention, which is set into motion with some degree of autonomy contributing to or resulting in a completed work of art” (Galanter, 2003). The key ingredient in this process of artistic creation is a generative system which provides an automated method for producing complex output. The output exhibits stylistic invariants, but also diverse and unpredictable facets, due to interactions between the system components and a number of parameters involved. The artistic quality of each piece remains to be assessed by the user. While generative art is defined as an autonomous realization of the piece of art, the artist takes a high place in the final output. Rules are in the heart of the creation process, but it is the human who defines these rules. Computers are extensively used in the context of generative art. They allow processing algorithms such as recursive fractal equations or L-Systems and turning them into a visual or audible experience. The present paper focuses on the creation of digital images, yet generative art applies to many other forms including music (Eno, 1996), 3D sculpture (Tabuada et al., 1998) or animation (Sommerer & Mignonneau, 2009). 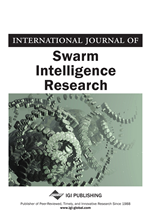 During the last decade, the use of swarm intelligence has also been studied in this context. Moura was probably the first to coin the term “Swarm Art,” denoting the subset of generative art where a number of agents collaboratively work on an emerging piece (Moura & Ramos, 2002). However, these agents typically do not possess other life-like characteristics such as growth, metabolism or reproduction. More recently, those dynamics have come into focus. It has been suggested to borrow ideas from natural ecosystems for creation in generative art (Dorin, 2004). In these “creative ecosystems,” artificial agents not only interact with one another and with their environment, but also complete a life cycle and potentially evolve. The approach raises a number of interesting questions about which ecosystem mechanisms are most useful for creative design and how they can be adapted to generative art. The present paper extends this line of research and explores the artistic potential of a generative ecosystem with resource chasing and consumption. We focus on the fundamental impacts of these dynamics on the final images and suggest what their contribution for generative art could be. The next section gives an overview of the origins and the concepts of generative art. The ecosystem model is briefly introduced. Several basic experiments of image generation are described and discussed. We highlight the interest of the model by a number of more complex applications. We finally conclude the paper and present the perspectives on the approach.